KYBELLA® (treatment for fat under the chin) now available at Vita! 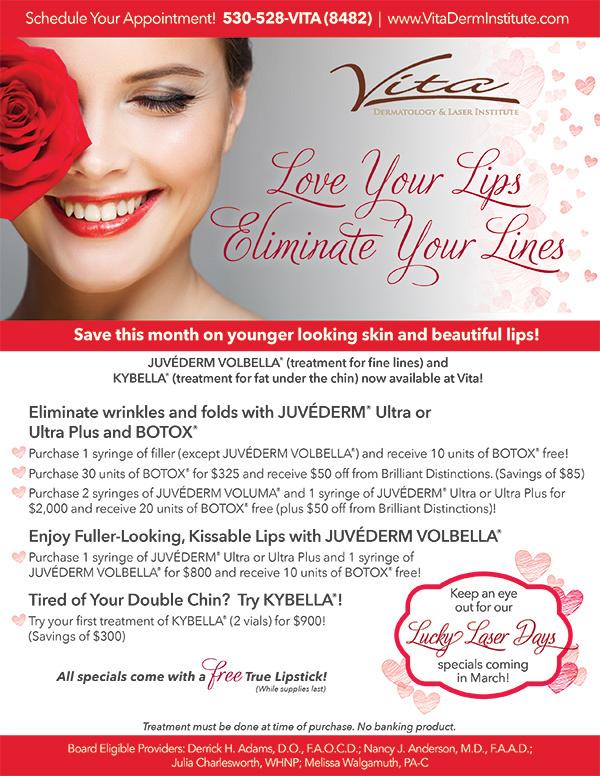 • Purchase 1 syringe of filler (except JUVÉDERM VOLBELLA®) and receive 10 units of BOTOX® free! • Purchase 2 syringes of JUVÉDERM VOLUMA® and 1 syringe of JUVÉDERM® Ultra or Ultra Plus for $2,000 and receive 20 units of BOTOX® free (plus $50 off from Brilliant Distinctions)! • Purchase 1 syringe of JUVÉDERM® Ultra or Ultra Plus and 1 syringe of JUVÉDERM VOLBELLA® for $800 and receive 10 units of BOTOX® free! • Try your first treatment of KYBELLA® (2 vials) for $900! Special pricing above good through February 28th, 2017. Treatment must be done at time of purchase. No banking product. Juvederm Volbella is a long-lasting injectable that enhances the contour and fullness of your lips, and provides very natural, beautiful results. Botox is an FDA-approved treatment that only takes minutes to smooth wrinkles in the forehead, crow’s’ feet, and between the eyes.